Can Artistic Bike Racks Meet Rigorous Design Standards? Since I doubt the standard approach to bicycle planning will encourage more people to bike to Clackamas Community College (CCC), I have been thinking of creative ways to entice people to bike. While I could install standard bike racks, this will not create the visual shock value I am seeking. CCC has a Welding Technology Program with teachers that are American Welding Society-certified professionals, so I am partnering with welding teachers to have them teach their students how to weld artistic bike racks. While I am excited about this partnership, I need to be cautious about how the artistic bike racks are designed. This is a major reason why most bike planners only install standard bike racks. Can artistic bike racks meet rigorous design standards? The main welding teacher has expressed excitement to have a real-world project for their students to work on. He invited me to present my idea to everyone in the Manufacturing Department at the October department meeting. Since my position is not located in the Manufacturing Department, I feel honored to help break down silos by presenting to a different campus department. While I want to give the welding teachers and their students full artistic freedom, I need to ensure the artistic bike racks meet rigorous design standards. I have not worked with welding teachers and students before and have no welding experience, so I am curious to learn how feasible this process is. I am thankful the Manufacturing Department is open to considering my idea. Since this is a perfect opportunity to include placemaking, I plan to suggest placemaking ideas be included in the artistic bike rack designs. Placemaking could include showing pride in CCC or Oregon City. CCC’s main campus is located in Oregon City, which has a rich history because it is the End of the Oregon Trail. If possible, I want to include this history in the artistic bike rack designs. The below artistic bike rack on the Trolley Trail in Milwaukie, OR is an example of placemaking because the bike rack was designed to showcase the Trolley Trail’s history. You may be wondering why I feel it is so important to create artistic bike racks and have welding students create them. Since I feel it is challenging in an American suburb to entice people to try biking, I feel it is important to create a visual shock value. Standard bike racks cannot create this visual shock value. I chose to have welding students instead of an off-campus bike parking company create the artistic bike racks because I assume the students will want to use the bike racks that they create and show them off to their family and friends. While an off-campus bike parking company is more familiar with bike rack design standards, their employees will not use the bike racks. Plus, I hope to save CCC money by producing the artistic bike racks on campus. Since creating artistic bike racks are not free, I am currently applying for a grant that does not require a financial match. Grant winners will be announced on November 19, 2018. What do you think of my idea? “Boston at Eye Level” is a reference to “The City at Eye Level”. While I know you’re waiting for me to write about how I feel being back in Oregon, I have two posts I want to share before writing about my life back in Oregon. The first post is about Boston and the second post is about Denver. Since I knew I’d be moving back to Oregon, I quickly planned a weekend trip to Boston from after work on Friday, May 4 to early morning on Monday, May 7. I arrived back in Arlington, VA after midnight on May 7 then worked at the City of Alexandria, VA that morning. I was excited to explore Boston for the first time and catch up with Keihly Moore and Jesse Boudart. Keihly graciously invited me to stay at her home in Boston’s Egleston Square Neighborhood and borrow one of her many bikes. Before I arrived at Keihly’s home, I was amazed by the Massachusetts Bay Transportation Authority (MBTA), which is the Boston region’s transit system. Unlike Metro in the DC region, MBTA in the Boston region doesn’t require users to swipe their transit pass to exit the station. I was embarrassed when I arrived at the exit turnstile and tried to use my transit pass to exit. Since I couldn’t find a way to swipe my transit pass on the exit turnstile, I had to ask someone how to do this. They looked at me as if I was an alien and said to just walk through the exit turnstile. I followed their lead and was able to exit the station. Since the MBTA doesn’t know where riders exit, it can’t charge riders based on how far they travel, which is what Metro does in the DC region. MBTA also can’t collect any destination data, so MBTA only has the origin data. As a GIS and transportation data nerd, I would find it frustrating to work with transit data in the Boston region. Boston’s exit turnstiles. Photo: OUTFRONT Media Inc. I arrived at Keihly’s home after a short walk (I’m used to walking miles) from the transit station. Since her home is up a steep flight of stairs and I have an extreme fear of heights, I had to overcome my fear to enter and exit her home. I’m thankful I visited Keihly during the spring because the stairs would have been covered in snow during the winter. When this happens at my home in the South, I would just wait for the snow to melt, which usually takes a day. Since it constantly snows in Boston during the winter, I’d be waiting all winter to leave. Since Keihly had a long training ride on Saturday to prepare her for the 5-day, 400-mile Bostreal (Boston to Montreal), Jesse gave me a nerdy bike tour of the Boston region. 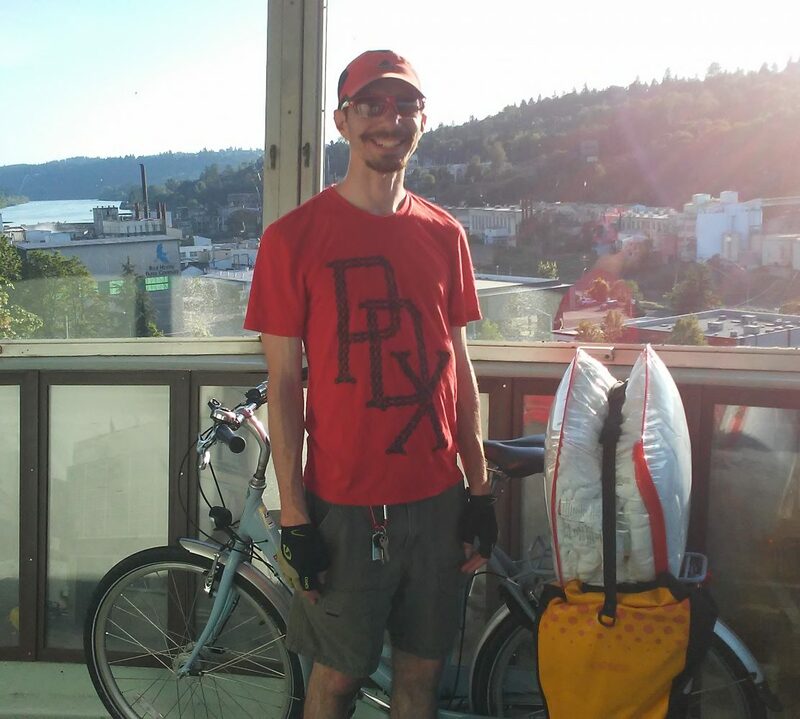 Jesse, who now works as a traffic engineer at Toole Design Group, was one of my two Association of Pedestrian and Bicycle Professionals (APBP) mentors in 2016. We had only Skyped during our 3-person meetings, so I got to meet Jesse for the first time in person when I visited Boston. I was exhausted from biking several miles on a bike I hadn’t ridden before that I forgot to take a selfie with Jesse. Since Jesse only had a few hours to give me a bike tour of the Boston region, we didn’t stop often to take photos and I didn’t want to risk my phone falling out of my hand while biking. Due to this, the below photos are the only photos I took. View of Downtown Boston from a trail on the north side of the Charles River. Boston has a great trail network along both sides of the Charles River. I enjoyed talking with Keihly so much on Sunday that I forgot to take photos. Or maybe I didn’t want to be seen glued to my phone taking photos. I think it’s a combination of these factors. Either way, I enjoyed the limited time with Keihly. Even though I had heard of Boston’s famous Emerald Necklace, which was designed by the famous Frederick Law Olmsted, Keihly showed me why he would be embarrassed by some of how Boston implemented his design. The below 8-lane highway, which connects Jamaica Pond and the Arnold Arboretum, is supposed to be part of the Emerald Necklace. While the highway does have trees, it doesn’t feel like a park with 8 lanes of traffic and narrow sidewalks! My flight back to Baltimore-Washington (cheaper than flying to DC’s Reagan and Dulles) was late in the evening and Keihly had a rare Sunday work presentation at a church, so I explored more of Downtown Boston on my own. Since I was still new to Boston, I was thankful to have help finding things to do. My Portland (not the original Portland in Maine) friend, Carl Larson, suggested the Black Heritage Trail. While the trail wayfinding could have been improved, I was able to find most of the sites, which taught me about Boston’s role in the Underground Railroad. As is common in most of the US, the White-focused Freedom Trail is much more of a tourist attraction than the Black Heritage Trail. Many tour companies charge money so tourists can learn about the Freedom Trail’s sites from their professional guides. I visited many of the sites along the Freedom Trail. I'm glad I took a weekend vacation to #Boston. Thanks to @lilbikesbigfun for suggesting the Black Heritage Trail. I enjoyed learning about Underground Railroad sites. Time to catch my flight back to Baltimore-Washington! I explored Downtown Boston’s cool Washington Street pedestrian mall on my way to catch transit to the airport. As with most other pedestrian malls in the US, the Washington Street pedestrian mall was short so I hope Boston expands it someday. I’m sure this pedestrian mall is short because motorists didn’t want to lose too much access to Downtown Boston. My next post will be about my long layover in Denver when I was moving back to Oregon then I’ll write a post about being back in Oregon. I’m following up on my last post, which discussed Capital Bikeshare and dockless bikeshare in the Washington, DC region. While I agree that dockless bikeshare companies should be held accountable to making sure their bikes are parked correctly, why aren’t dockless automobile companies being held to the same standard? Dockless automobiles have been parked illegally for decades. Where is the public outrage? Why is most of the public outrage focused on dockless bikes? Today is the National Day on Writing, which asks people to share why they write using #WhyIWrite. I started this blog in 2014 and wrote the following post because I’m passionate about opening people’s eyes to transportation issues that I also used to be blind to. Since Greater Greater Washington‘s staff helped me write this post so it could be posted on their blog, the structure is different from what I usually write on my blog. The Lee Highway Alliance (LHA) in Arlington, Virginia is working to make the Lee Highway Corridor more economically vibrant, walkable, and attractive. State of Place is helping them achieve their walkability goals. Walkability is simply a measure of how friendly a given place is to walking. People who live in highly walkable places see a slew of health, environmental, and financial benefits. The Lee Highway Corridor is located in north Arlington just north of the Rosslyn-Ballston Corridor. Unlike the Rosslyn-Ballston Corridor, which helped Arlington win the Gold 2017 National Planning Achievement Award for Implementation, the Lee Highway Corridor remains a primarily automobile-dependent, suburban-style place. Rosslyn-Ballston Corridor, past and present. Images by Arlington. As is typical of most of the commercial corridors built throughout the country during the mid-to-late 20th century, the general development pattern of the Lee Highway Corridor is low-rise commercial development with prominent surface parking lots and limited pedestrian, bicycle, and transit infrastructure. It is a major automobile commuter corridor. In order to create the place that the LHA envisions, the Lee Highway Corridor needs to become a place that prioritizes people and community over automobiles. Since the LHA wants to provide people with healthy transportation choices and attract vibrant economic development, it hopes to improve the Lee Highway Corridor through a new vision that includes distinct, walkable, mixed-use neighborhood centers. Proposed neighborhood centers showing a spectrum of density. Image by Arlington. Illustrative concept for Lee Heights shopping center, existing and proposed. Image by Arlington. So how do planners determine how walkable an area is? Recently, LHA was one of six organizations across the US to win a five-block walkability analysis from State of Place, a software company that uses predictive analytics to quantify what people love about a given place. State of Place uses ten urban design categories, such as density, connectivity, and traffic safety, to assess how walkable a block, a group of blocks, or an entire neighborhood is. During the past several months, they assessed the walkability of Lee Highway. Results will be presented to the public on Saturday, October 21 from 10am-12pm at the Lee Highway Alliance office, which is located at 4620 Lee Highway, Suite 208. State of Place’s approach isn’t the only walkability assessment tool available. Another tool is called Walk Score, which provides a number on the 100-point scale that measures the walkability of any address. Most cities use Walk Score, but State of Place walkability researcher Dr. Mariela Alfonzo says this tool tends to overestimate the walkability of high-access, low-income communities, among other problems. Joe Cortright at City Observatory rebuked Alfonzo’s criticisms, saying State of Place’s metrics are highly complex, extremely labor intensive to gather, and consequently very expensive. Plus, they have not been implemented enough to let an objective third party assess their accuracy and utility. While there is no perfect way to assess how walkable an area or city is, both tools are a great start to understanding how to improve the accessibility and livability of a given area. I’ve had the opportunity to personally use the State of Place tool to conduct a similar analysis in Tigard, Oregon last year. With help from three of my Master of Urban and Regional Planning classmates from Portland State University, we created neighborhood walkability assessments for the Tigard Triangle and Downtown Tigard. My team used the inventory tool to capture data on more than 280 built environment features, in ten urban design categories, that contribute to the walkability on every street segment in this area. We underwent a rigorous training process where we practiced using the inventory tool in four different sample settings. Individual results from the four sample settings weren’t exact matches, so we understand our data collection in the Tigard Triangle and Downtown Triangle isn’t completely accurate. For example, one person could have felt safe walking on a street segment while another person didn’t feel safe walking on the same street segment. The index for the Tigard Triangle is 33 out of 100, a low walkability score meaning most trips require an automobile. For comparison, Downtown Tigard scored 66. The profile breaks the index down into ten urban design categories that contribute to the walkability of the place, so cities can know where to prioritize walkability improvements. As the profile shows, the weakest category for the Tigard Triangle is lack of parks and public spaces. However, increasing parks and public spaces don’t do as much for walkability as adding density, pedestrian amenities, and traffic safety. Since most cities have scarce resources, State of Place also provided the “Weighted by Impact and Feasibility (Walkability)” chart, shown below. Constructing a building is expensive and often depends on the private sector, so density isn’t the most feasible way to improve walkability. Since the public sector has more control over adding pedestrian amenities and improving traffic safety, and the non-weighted profile shows these are weak in the Tigard Triangle, they are the most feasible ways to improve walkability in this place. The city used this data and my team’s recommendations to help create the Tigard Triangle Lean Code, which was adopted in August 2017. The lean code promotes building and site designs that improve walkability. Tigard Triangle Lean Code. Image by Tigard. If this analysis interests you, results from the Arlington walkability analysis will be presented to the public by State of Place on Saturday, October 21 from 10am-12pm at the Lee Highway Alliance office, which is located at 4620 Lee Highway, Suite 208. I plan to write a post with public reaction to the results. I wasn’t planning to write a post about my trip to Great Falls Park today because I assumed all that I would see and learn about was Great Falls. I quickly realized how Great Falls Park’s transportation history directly impacted my transportation options to reach Great Falls Park from Arlington, VA. The visitor center at Great Falls Park has an exhibit devoted to the Great Falls and Old Dominion Railroad, which used to operate a trolley from Georgetown in Washington, DC to Great Falls Park, so I enjoyed learning more about the railroad and trolley. The trolley, which is shown in the below map, was in operation from 1906 to 1932. While I was frustrated because I felt forced to drive to Great Falls Park today, I’m hopeful a new trolley system to Great Falls Park is built someday. Since the Great Falls Park parking lot was packed even in winter and many people in the DC region likely would prefer to leave their car at home, I assume a new trolley system would be successful. Surprisingly, the DC to Great Falls Park trolley line wasn’t originally built to take people from DC to Great Falls Park. Instead, the trolley line was built for people commuting from Fairfax County, VA, which is where Great Falls Park is located, to Washington, DC. Since the trolley line wasn’t attracting enough customers on the weekend, the Great Falls and Old Dominion Railroad built the Great Falls Amusement Park, which had more amenities than the current park, to attract people to use the trolley line on the weekend. According to the visitor center exhibit, the Great Falls Amusement Park was a huge success and most people arrived by trolley. Since the trolley took 45 minutes and horse and buggy took 2 hours, I can see why the trolley was so popular. As is common with trolley systems throughout the US, automobiles proved to be faster and became more popular than trolleys so the DC to Great Falls trolley closed. I realize a new trolley line isn’t coming anytime soon so I looked for other options to get to Great Falls Park. While I saw a group of training cyclists risking their lives on Old Dominion Drive, which is a curvy, two-lane rural road where they were biking, I wasn’t willing to risk my life biking on Old Dominion Drive so I’m thankful I chose to rent a car through Turo and drive to Great Falls Church. Since I used Getaround one time in Oregon to go hiking with Gerald and my dad used Turo to rent a car when he visited me in Portland for my graduation, I compared Getaround and Turo. I found more cars available in Arlington and cheaper cars through Turo so I rented a car through Turo. Yes, I drove a car for the first time today since driving from Kannapolis, NC to Charlotte during winter break in December 2015. I get very anxious when driving and feel more comfortable walking, biking, and riding transit so I’ve been trying to avoid driving. Even though the rental car turned out to be useful, I didn’t originally get the rental car to go to Great Falls Park. I was originally planning to use the rental car to drive to Columbia, MD to meet Belita, who is a Nigerian (born and raised in Nigeria) woman I met through OkCupid. While normally I wouldn’t drive 80 miles round-trip to meet a woman, Belita lives in a famous planned community called Columbia, MD so I was already planning to visit Columbia someday. Having the opportunity to meet someone new, especially an attractive woman, is an added bonus. Plus, Belita offered to give me a personalized tour of her hometown and invited me to experience mass with her. If she gives me permission, I plan to interview her for a blog post about growing up in Nigeria, moving to the US, and her experience living in the planned community of Columbia. I’m looking forward to meeting Belita and visiting Columbia!